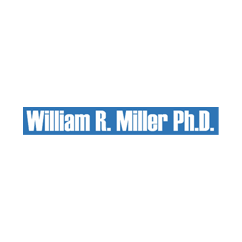 Dr. William R. Miller is Emeritus Distinguished Professor of Psychology and Psychiatry at the University of New Mexico, where he joined the faculty in 1976 after receiving his Ph.D. in clinical psychology from the University of Oregon. He served as Director of Clinical Training for UNM’s APA-approved doctoral program in clinical psychology and as Co-Director of UNM’s Center on Alcoholism, Substance Abuse and Addictions (CASAA). Dr. Miller’s publications include 40 books and over 400 articles and chapters. Fundamentally interested in the psychology of change, he has focused in particular on the development, testing, and dissemination of behavioral treatments for addictions. He served as principal investigator for numerous research grants and contracts, founded a private practice group, and served as a consultant to many organizations including the United States Senate, the World Health Organization, the National Academy of Sciences, and the National Institutes of Health. In recognition of his research contributions, Dr. Miller is a recipient of the international Jellinek Memorial Award, two career achievement awards from the American Psychological Association, and an Innovators in Combating Substance Abuse award from the Robert Wood Johnson Foundation. He maintains an active interest in pastoral counseling and the integration of spirituality and psychology. The Institute for Scientific Information lists him as one of the world’s most cited scientists.